are available, and 25 Artist's Proofs. 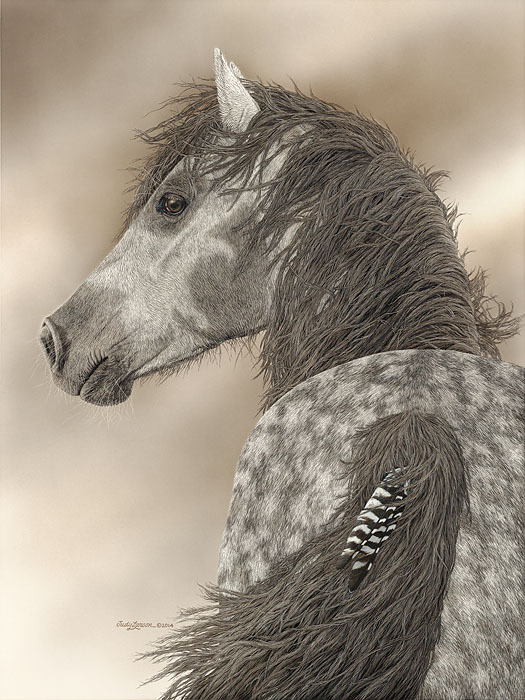 Judy's newest release, "Long Ago and Far Away," features a free, wild stallion. Signed and numbered giclee canvases, as well as Artist's Proof giclee canvases, are available in very limited editions. Canvases are gallery-wrapped, ready to hang. Click here to read more about the story behind "Long Ago and Far Away," or to order this new giclee canvas. 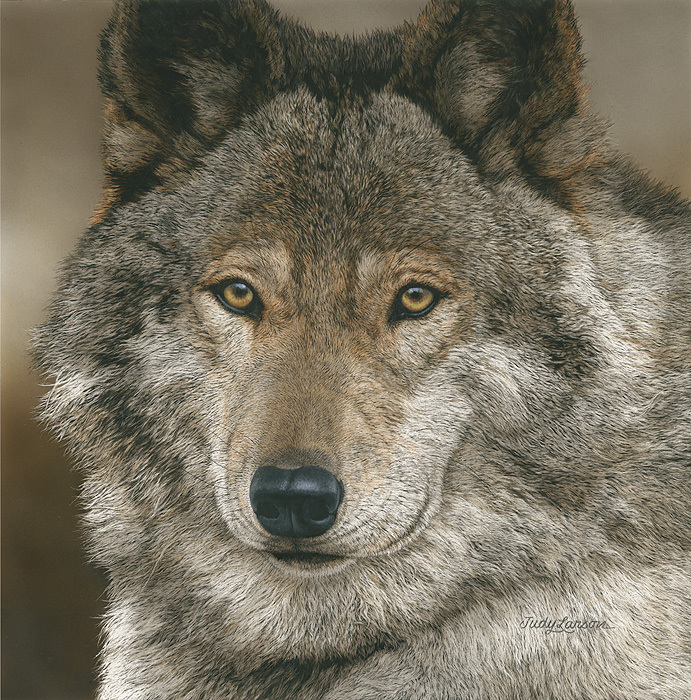 Judy's newest release is "The Peacemaker," an essential member of the wolf pack who, by his calm nature, helps to maintain harmony among his family. Signed and numbered giclee canvases, as well as Artist's Proof giclee canvases, are available in very limited editions and are gallery-wrapped, ready to hang. Click here to learn more about the story behind this image, or to order this new giclee canvas. 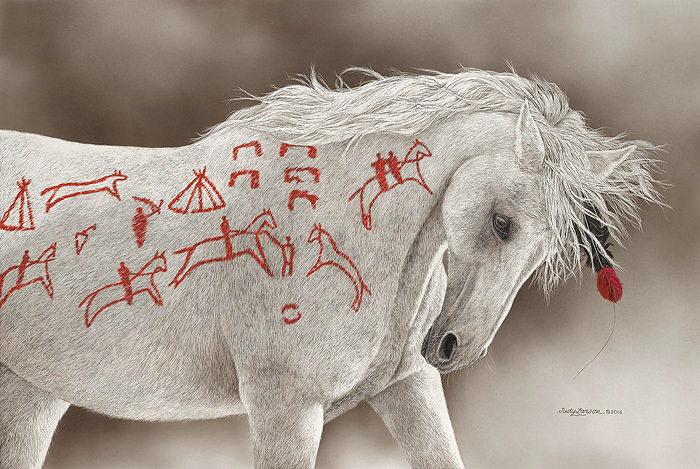 accomplishments by painting medicine symbols and picture writings on his old, white war horse. Signed and numbered giclee canvases, as well as Artist's Proof giclee canvases, are available in very limited editions. The canvases are gallery-wrapped and ready to hang. 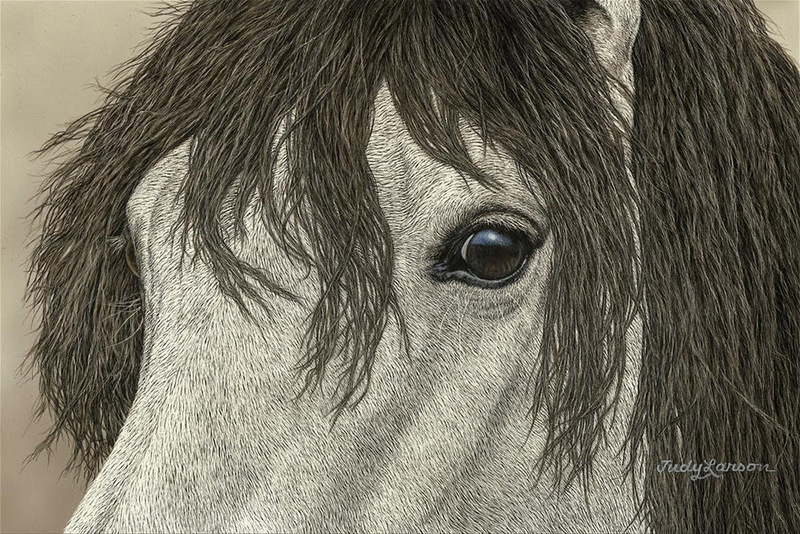 Click here to learn more about "The Advertising Horse," or to order this new giclee canvas. 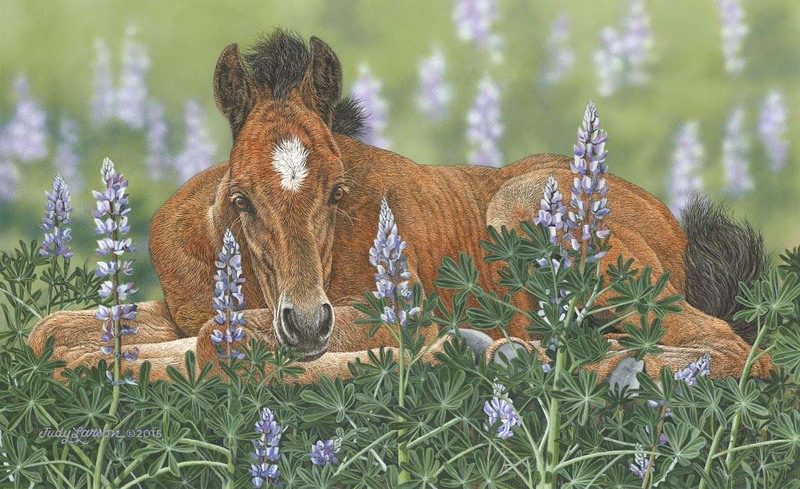 Judy's newest release is "Lounging in the Lupines," which features a young foal serenely resting in a field of lupines after frolicking with the herd. Signed and numbered giclee canvases, as well as Artist's Proof giclee canvases, are available in very limited editions. All canvases are gallery-wrapped and ready to hang without framing. Click here to learn more about "Lounging in the Lupines," or to order this new giclee canvas. 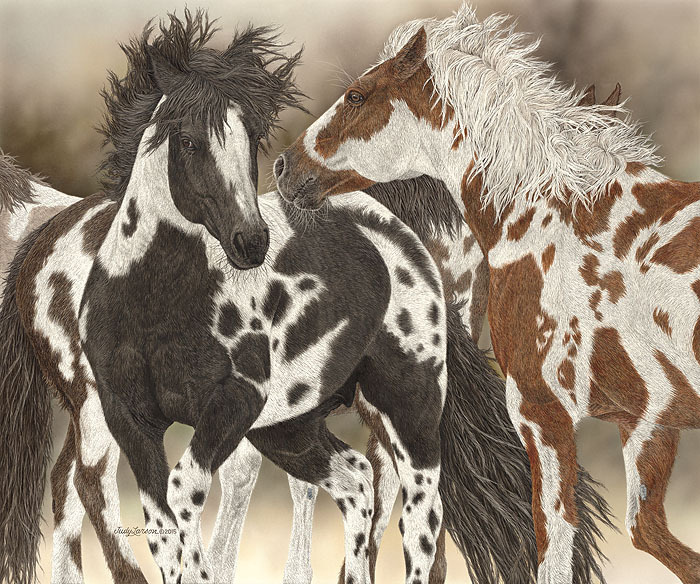 MAY RELEASE: "BOYS TO MEN"
Judy's newest release is "Boys to Men," the first offering in a series dedicated to bands of wild horses. 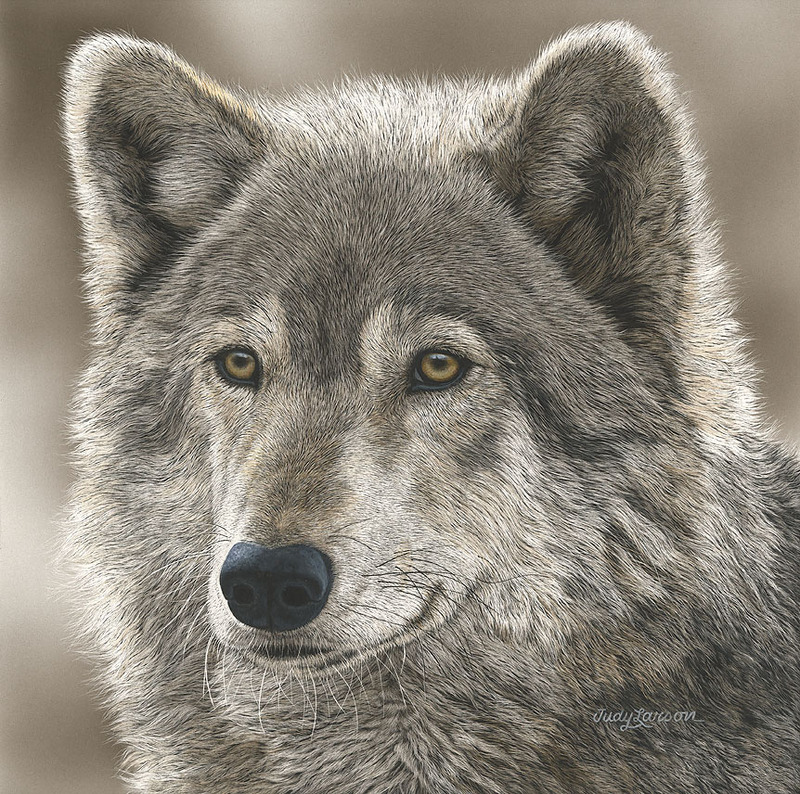 signed and numbered fine art paper edition is also available as is a limited number of fine art paper Artist's Proofs. fine art paper editions in two different sizes. Judy's newest release is "The Play Wolf," which pays homage to the essential role of initiator of play within a wolf pack. Signed and numbered giclee canvases, as well as Artist's Proof giclee canvases, are available in very limited editions. MAY RELEASE: "STARS AND STRIPES"
well as Artist's Proof giclee canvases, are available in very limited editions. Click here to learn more about the inspiration behind "Stars and Stripes" or to order this new giclee canvas in two sizes. 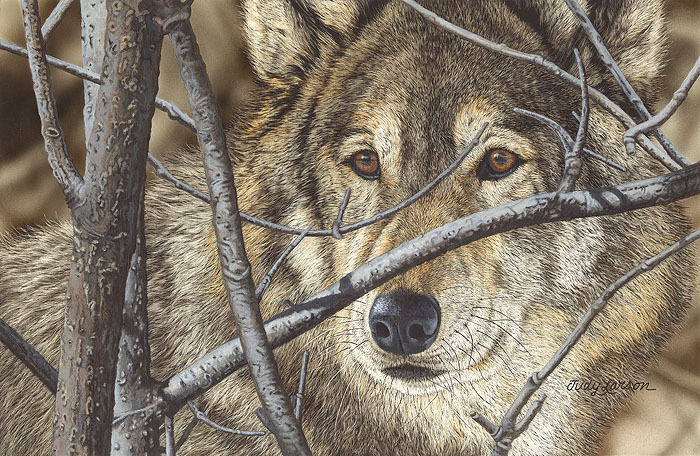 NOVEMBER RELEASE: "HIDING IN PLAIN SIGHT"
"Hiding in Plain Sight" is available both as an 8 1/2"h x 12"w signed and numbered fine art giclee canvas and as an Artist's Proof giclee canvas. 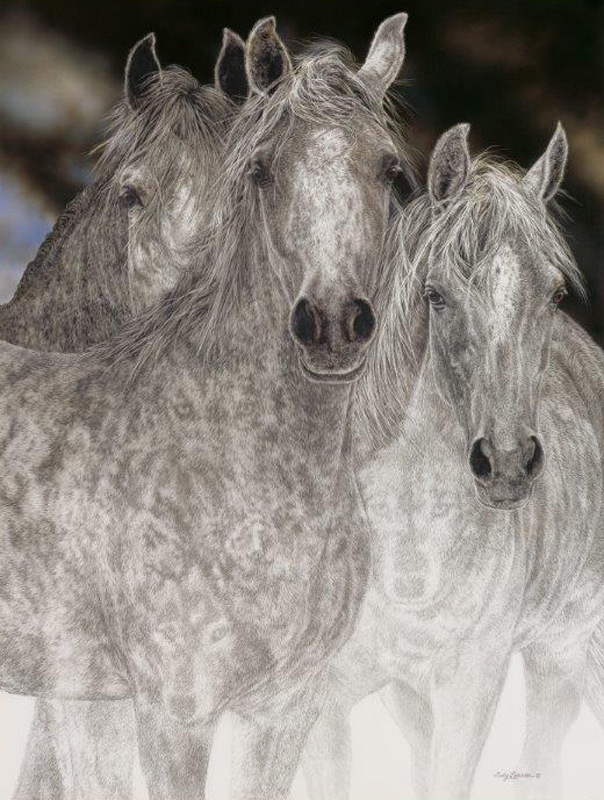 Click here for the story and for more information, or to order this SmallWorks giclee canvas in very limited editions.